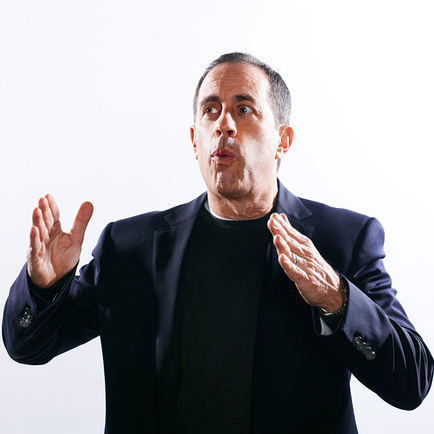 According Jonah Weiner, Jerry Seinfeld’s success stems from audience intimacy. It’s about making small things appear big. And it’s about obsessing over details like building a Japanese cricket cage. Jonah is not defending the architecture of Seinfeld, the popular nineties sitcom. He’s talking about dying while standing up. Because to live is to stand up to failure. The NY Times Magazine profile showcases Jerry’s obsession with joke refinement. An exercise which might take years to accomplish. Akin to the mastery of a violin. An intricate process of analyzing texture of sounds. Experimenting with pacing of syllables. Teasing out imagery with a 7th grade vernacular. And building a catalog of different kind of laughs for the aggregate win. What strikes hard is the honesty Mr. Sienfeld brings to his craft. Never quite satisfied. Restless. Unimpressed with standing ovations. Curious about variations. Jerry turns the jokes over in his mind like a rock in a tumbler. The job is complete only when a smooth stone emerges. This is essence of the Dinner Lab. A comedy club for chefs. A place to dare recipes. To cook for dozens of foodies crazy enough to spend one hundred dollars for the privilege of spending even more on a single event. Make no mistake. 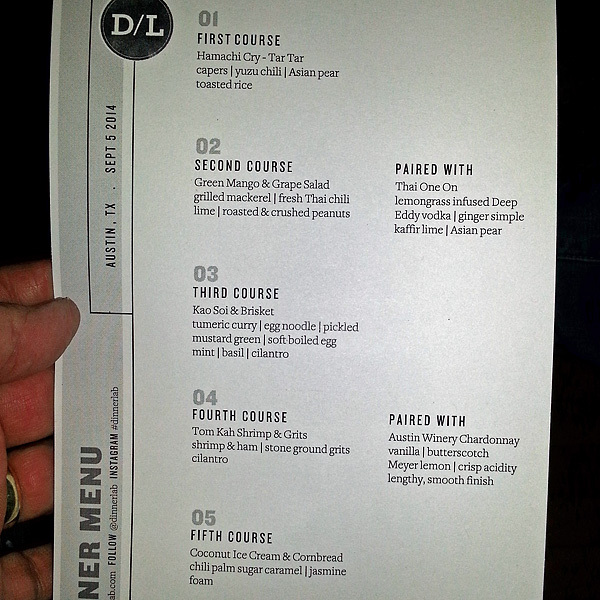 This for-fee supper club doesn’t guarantee that any given event remains open long. Many events sell out in an hour or two. Which makes second showings sprout like mushrooms. 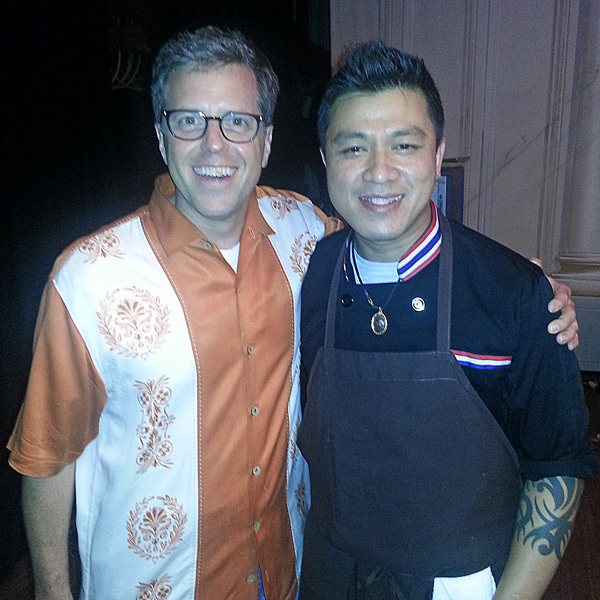 Chef Ek Timrek steels his courage in The Scottish Rite Theater in Austin this weekend. He draws upon Thai heritage and skills honed back home and in Germany and Colorado. He is one of the founding members of East Side King and no stranger to a sushi knife. On this night he brightens our understanding of cuisine from Asia. 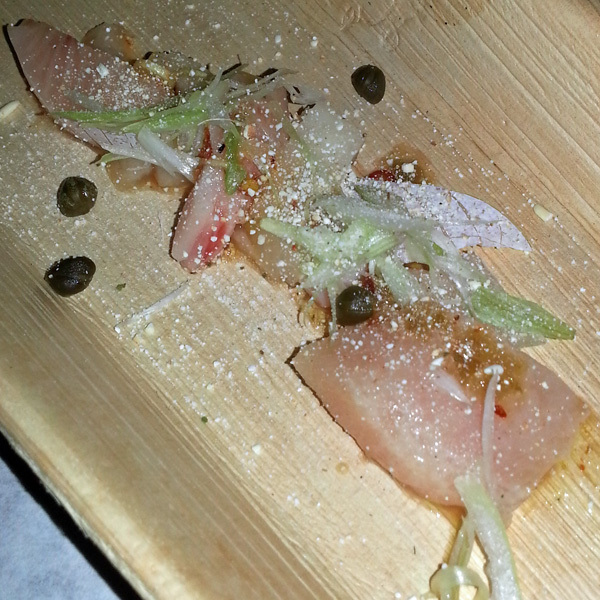 First up is a lay up: raw hamachi (yellow tail) with asian pear spiced up with peppers. It’s natural soft texture challenged with toasted rice crumbs. Classic pairings from Uchiko. A mental judo chop with fish and fruit masquerading as brothers-from-another-mother. The unannounced caper berries spike the dish with salt. And a classic Thai move to bring the four horsemen (sweet, salty, sour, bitter) to the table. The green mango salad arrives dressed in tart and sour. The halved redskin grape provides visual appeal and a slight sweetening. 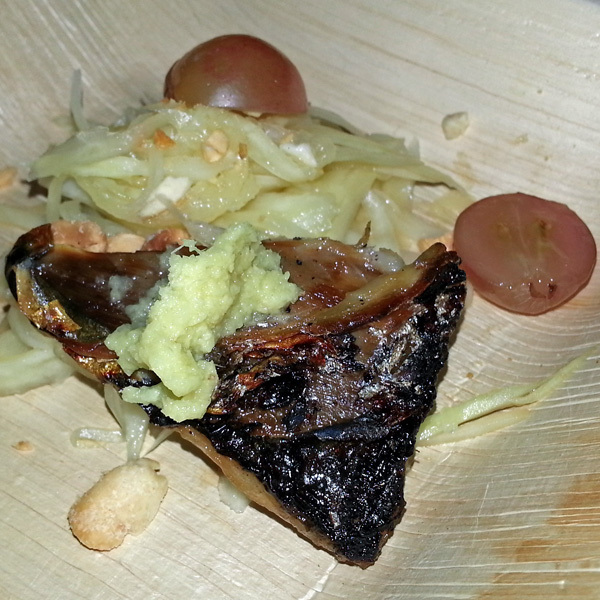 The mackerel wedge means to shapeshift the taste image with an umami profile. While the effort valiant, the dish misses. This went from salad seasoned by fish to fish seasoned by salad. More of a wedding crasher than a heart throb. 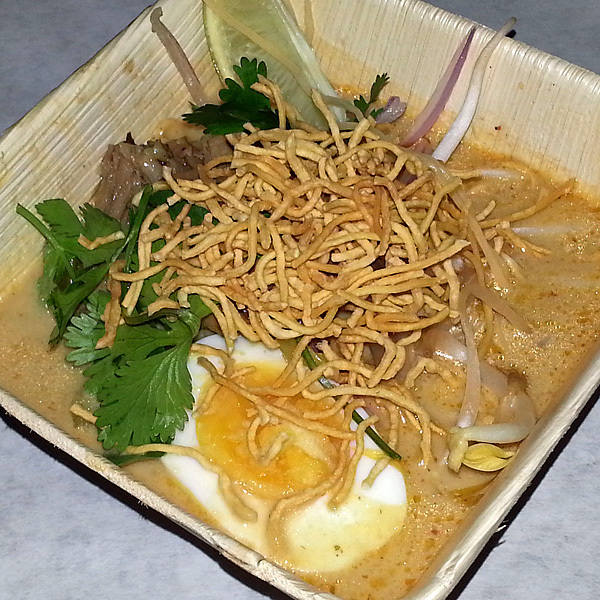 Kao Soi with brisket (image up top) steals the evening. A textural palace with each room more gilded than the next. Solid chew of egg noodles with the heady broth of tumeric curry. Then a bounce back of the hard-boiled egg where the coconut milk, lime juice and fish sauce showcase heavenly grace. Crunchy noodles stand on top like kindling above hot embers ready to burst into culinary flame. Sour notes from the pickled mustard green tiptoe in the background. This dish will hasten people to arrive with wallets wide open. 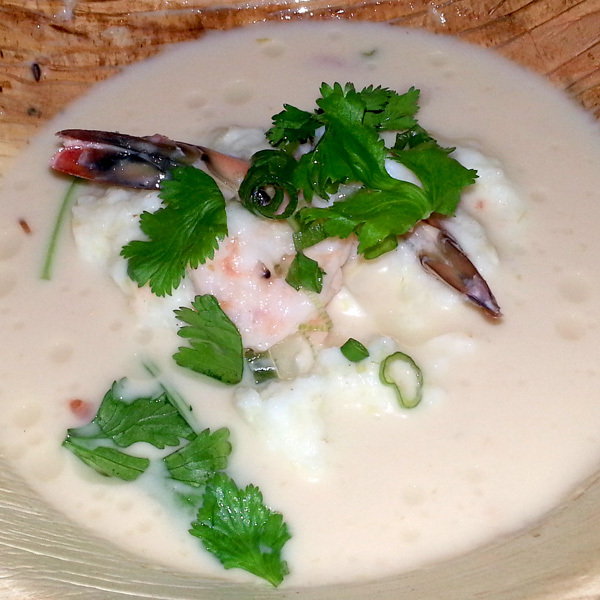 Chef Ek upgrades shrimp and grits with the famous coconut milk soup, Tom Kah Gai. Cilantro, mint and basil doing their part to cool off the dish. The evening ends with cocunut ice-cream, sweetened cornbread and jasmine foam. Yes, a bubble bath treatment to dessert. Regardless, Ek delivers the punchline. He makes the small big. He sweats the details. And best of all, he connects intimately with the audience. Bravo. Now let’s see what it takes to get you to syndication. Okay, my amazing son…..loved the journey into the mind of the most creative child on earth. But I must stress DESERT is sand, desolation, despair with beauty in place but at no time edible. DESSERT is something you savor with your mind and mouth. You might consider setting your spell checker to auto convert since you rarely take us to a desert sand locale. I’m just saying! Love, Mom p.s. you’re still my favorite writer of unique stories!! !